Bursitis is inflammation of a small sack of fluid (called a bursa), located at various parts of the body. Its purpose is to aid movement by reducing friction between tendons and bone. The main cause is overuse, but they can become inflamed from direct trauma. Treatment usually involves rest, although surgery may sometimes be required. 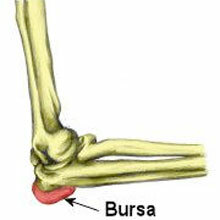 Bursae (or bursas) are small sacks of fluid which lie between a tendon or muscle, and the underlying bone. Their purpose is to reduce friction between the tendon as it moves over the bone. There are approximately 160 bursae in the body. These sacks can become inflamed from overuse, or sometimes from a direct impact or trauma, causing pain over the affected area. Bursitis is more often an overuse condition from repeated rubbing of the overlying soft tissue. Bursitis from direct impact or trauma is due to bleeding into the bursa. In cases of impact bursitis, a large, swollen, tender area will area soon after impact. Symptoms of overuse bursitis are less defined. There is usually a swollen area, although less defined than with an impact injury. There will be a pain on movement which involves contraction of the overlying muscle (or tendon – e.g. 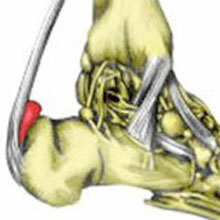 the Achilles tendon). The bursa will be tender to touch (if possible). It is sometimes difficult to distinguish between bursitis and injury to the overlying tendon, without an MRI scan. Impact bursitis should be iced and a compression bandage applied. If the swelling doesn’t decrease naturally, the bursa may need to be aspirated (the fluid is drained using a needle). Overuse of bursitis injuries is more difficult to treat. Rest from any aggravating activities and the use of anti-inflammatory medication is usually recommended. Occasionally the bursa may need to be aspirated, or a corticosteroid injection may be required. If the bursa is thought to be caused by any biomechanical, postural or muscular imbalances, then these should be addressed before returning to activity. Iliopsoas bursa – between the iliopsoas muscle at the front of the hip joint and the underlying bone (bursitis in this area is also known as Iliopectineal bursitis). 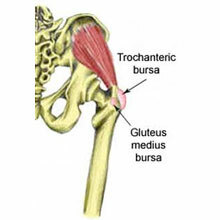 By far, the most common type of hip bursitis is from the trochanteric bursa and is caused by one of two ways; through a direct impact to the bursa, such as a fall onto the outer hip, or through repetitive friction from the overlying muscles and tendons, usually from running. This repeated friction results in the bursa becoming inflamed and swollen. Every time the tendons then rub over the bursa, this causes pain. Achilles bursitis, also known as retrocalcaneal bursitis in athletes, particularly runners. It can often be mistaken for Achilles tendonitis or can occur in conjunction with Achilles tendonitis. Symptoms include swelling, pain, and tenderness at the back of the heel. Treatment includes rest, applying cold therapy, and protecting the bursa with a horseshoe-shaped padding at the back of the heel. Read more on Achilles bursitis. 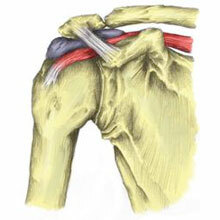 Subacromial bursitis is inflammation of a bursa in the shoulder. Symptoms include shoulder pain over a 60-degree arc when the arm is lifted sideways and upwards. The subacromial bursa is a sack of fluid over the tendon, which helps facilitate movement. The bursa can become trapped, especially in sports where the arm is regularly at or above shoulder level. Treatment is rest, reducing symptoms followed by shoulder rehabilitation exercises. Read more on subacromial bursitis. Infrapatellar bursa is inflammation of the infrapatella bursa below the kneecap. Symptoms consist of pain at the front of the knee with swelling over the area of the infrapatellar bursa. Pain may be similar to that of jumper’s knee or patellar tendonitis with pain just below the kneecap. Read more on infrapatella bursitis. 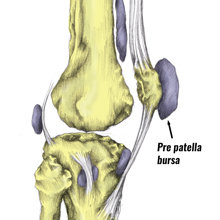 Pes anserine bursitis is inflammation a bursa on the inside of the knee. Pes anserine is the combined tendon of three muscles on the inside of the knee and inflammation of the tendon itself is likely to occur. Symptoms include pain on the lower inside of the knee, particularly when lifting the upper leg. Read more on pes anserine bursitis. Housemaid’s Knee also known as prepatellar bursitis or knee bursitis, is a swelling of the bursa or small sack of fluid at the front of the knee. It can be acute or sudden onset or chronic where it occurs gradually over time. Read more on pre-patella bursitis. Elbow bursitis, also known as Students elbow or Olecranon bursitis, is the inflammation and swelling of the bursa which protects the end of the ulna bone at the back of the elbow. Repeatedly leaning on elbows (like many students do) can cause pain as the bursa can become inflamed. This elbow injury could also be caused by a direct impact. Read more on Olecranon bursitis.